The following article presents a basic overview of common questions relating to the classification of a cleanroom. There are a lot of determining factors involved in choosing a cleanroom classification and every industry has a default standard to start with. In medical device packaging for instance, the default classification is ISO 7 (or a class 10,000) cleanroom. What are my sources of contamination? What size particles do I need to filter out? How much air do I have to circulate to get that contamination out? 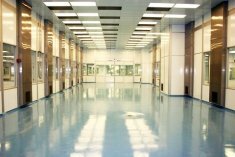 A typical cleanroom is designed to keep the outside environment from getting in. Once an environment has been built, the two things that cause contamination in it are the people and the process. So, what contamination is generated by people, and what contamination is generated by the process is what needs to be determined. Often times one can build a lower classification of cleanroom, though still maintain a cleaner environment by enhancing operations within the cleanroom - for instance, garmenting workers to a higher standard. Positioning return air grills and filtration systems at optimal locations within the cleanroom can result in cleaner areas within the environment, thus bringing the cleanroom classification to a lower level in those areas. Understanding the contamination sources and combating those with solid cleanroom design and enhanced operations can provide significant cost savings from both construction and operational standpoints. One of the most important factors to determine when constructing a cleanroom is what size of particle will need to be filtered out. Is it any size particle? Is it a specific size or range of particles? Often times, people look at the cleanroom classification (see chart below) and they go to the lowest level particle count to determine what classification they need. An example of this would be someone that determines they need less than 100 particles per square foot within their cleanroom. Based on this information, they determine that the classification will need to be an ISO 5 (or class 100) cleanroom. However, an issue can arise if they do not take into account the size of the particle they are trying to filter out. 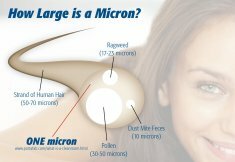 There’s a significant difference in the classification that is needed if that particle is 1/2 micron in size versus 5 microns in size (see Micron description below). If they think they’re looking at a ½ micron sized-particle, but really the particle that is a problem for them is a 5 micron particle – From a cleanroom classification, this doesn’t translate to an ISO 5 cleanroom (or class 100). This actually translates into an ISO 8 cleanroom (or class 100,000). Any time the classification goes down a class, or up a class - for instance from an ISO 8 (class 100,000) to an ISO 7 (class 10,000) - that’s going to take twice as much air. The cost of filtering and moving air is a significant cost of operating a cleanroom. This process translates all the way down through to the number of filters that are needed, the amount of return air space that is needed, the amount of air conditioning that will be needed to cool that return air and so forth. And this multiplies itself as one goes through the process. A common mistake involves a client asking for a cleanroom that is too tall, or otherwise in excess of what they really need. If you require a cleanroom with an 8-foot ceiling height, but decide to make it taller in order to align better with the surrounding environment and make it 10-feet high, that changes the volume of the area by 25%. Therefore they’re increasing the amount of air needed for that cleanroom by 25% because they decided on building a 10-foot height, when they only needed an 8-foot height. Single-Pass Airflow Design. 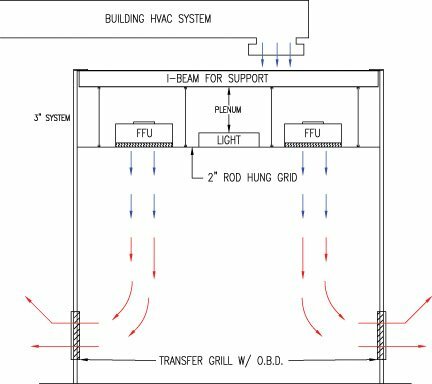 Review more information about cleanroom airflow designs on our cleanroom design page. What would seem to be a simple difference (moving from one class to the other) significantly changes the cost of a cleanroom - almost 25% for the same sized cleanroom at the same classification. Visit our cleanroom design page for more information about cleanroom airflow designs. For those companies that need to adhere to specific cleanroom design standards, they must understand that cleanrooms can be built and operated to meet different cleanliness classifications, depending on the environmental conditions required for their use. The primary authority for clean room classifications is the International Organization for Standardization or ISO. ISO 14644-1 classifies a cleanroom based on the size and number of airborne particles per cubic meter of air (see chart above). Prior to the implementation of ISO 14644-1, US Federal Standard 209E set the industry guidelines for cleanroom classification, and denoted the number of particles 0.5µm or larger per cubic foot of air. For instance, under FED-STD-209E, a "class 1000 cleanroom" would indicate 1,000 particles 0.5 µm or smaller in each cubic foot of air. FED-STD-209E was officially cancelled on November 29th, 2001, though both standards are still widely used. In the cleanroom environment, air particles are measured in microns (µm - see chart above). One micron equals one-millionth of a meter. Micron-sized particles are smaller than a living cell and can be seen only with the most powerful microscopes. Want to share this photo? Click above to download a larger version. Please provide a link back to this page (www.portafab.com/cleanroom-classification.html). By controlled and classified, this means that it is controlled to a particle level (via HEPA air filtration), its controlled to the temperature and humidity that has been specified, but it’s not classified in terms of the particle count. A “controlled and classified area” is pressurized, it features temperature control and the air is filtered. It is just not specified in terms of the amount of and size of particles within a given volume of air. In many cases, this type of environment is all that a client needs in terms of a “cleanroom”. If a company is not careful, they can end up building a cleanroom far beyond their actual requirements and there are dramatic costs involved with doing that. Read more about the differences between cleanroom and controlled environment applications, or Locate a Cleanroom Contractor for assistance with your cleanroom project. You can also request a custom quote by clicking the button below. We will be happy to provide a customized quote based on your specific requirements and application. Please fill out our Request a Quote form in order to get the process started..